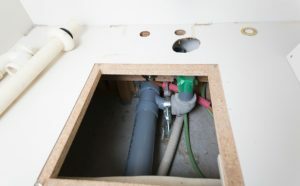 How to Detect a Slab Leak | Professional Plumbing, Inc. The first thing you will notice is a major spike in your water bill. You may be dealing with leaky pipes if you see a huge spike from one month to the next, or if you see increases in your water bill without increasing your water usage. Occasionally spikes can be caused by leaky appliances as well. Put food coloring in your toilet tank. If it moves from the tank to the bowl in ten minutes, you have a toilet leak, which may be the cause of the spike. Check all water-based appliances for leaks. The next thing to check for is wet spots on your floors. Pools of water and warped wood floors point to water build-up beneath the concrete slab. You may also notice mold or mildew smells. Foundation cracks can be a big sign that you are dealing with a slab leak. Check for warm or hot spots on the floor, which may indicate a leaking pipe. If any of your fixtures lose water pressure, it could be because the pipes supplying the water are broken. If you suspect you have a leak, call our plumbers for efficient slab leak repair in Riverside, CA, and the surrounding areas. This entry was posted in Uncategorized on December 14, 2018 by profplumb-inc.
Why Is My Toilet Gurgling?